So much has happened in the last month! I’m chagrined that I did not write once in November but hope to explain that I was not off on vacation. It’s been a time of loss for several of my dear friends and as they are traveling their road I have tried to help in the ways that I know how. For me that means bringing soup, being there to listen, and of course, by offering pies. 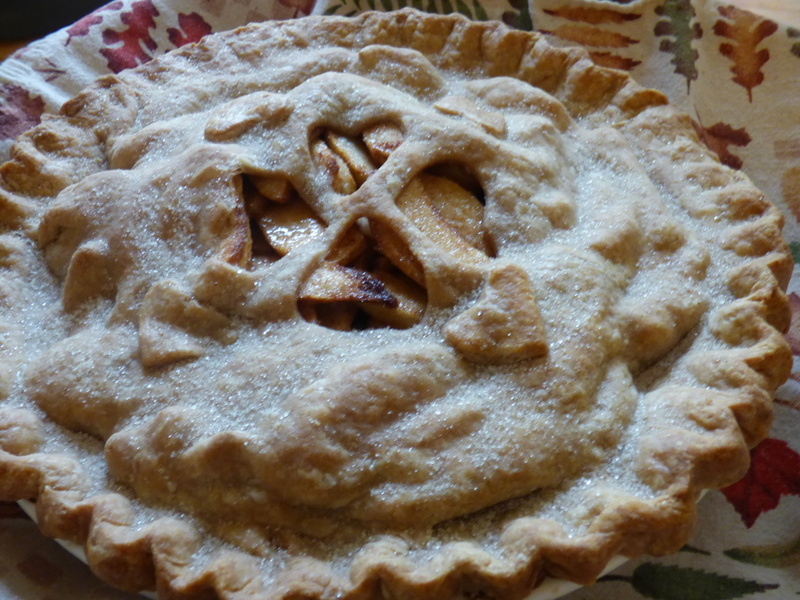 Pies, in and of themselves, are not going to do much to assuage the pain of loss. However, if my friends feel a little more loved for a while, then my efforts have been well worth it. Another reason I did not have time to write this past month was due to a different kind of loss. In early November I helped my Dad move back to Florida. He had lived there for almost twenty years before he had a stroke in March of 2013. After three trips to Florida that Spring I decided that he needed to come back to Oregon with me. My goal was to be able to take care of him AND (try to) live my life. To my great dismay, that plan did not work out. My Dad did not like being in Oregon and longed to be back in Florida near his girlfriend. After much deliberation, and with the blessing of his doctor and his social worker, I arranged for my Dad to move to the same facility where his girlfriend lives. Friends ask, “Is your Dad happy now?” and I answer, “I think so” but what I know for certain was that he was not happy here with me. Knowing that makes me a little sad but I have to honor his choice. It is, after all, his life. 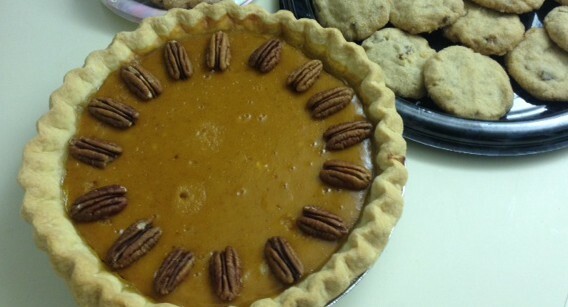 Before I left Florida, I made sure to bring a Pumpkin Pie to the woman in charge of the kitchen in my Dad’s building. It was a way to thank her in advance for her care and attention. Then I made some Pecan Shortbread cookies for the director of Nursing. It is my hope that they will help her to think fondly of my Dad. The rest of the month is a bit of a blur. A few days after I came back from Florida was the first night of the season for our church’s homeless shelter which I am helping to coordinate. It’s my first time in this role and I am humbled to be able to help those in need in a tangible way and honored to work together with all the caring people who make this shelter possible. That simple note made my day! I believe that kindness is something we can all give to one another. Often the cost to us is minimal, but the difference it can make in the lives of those around us is immeasurable. I’d love to hear your stories of how an act of kindness made your day… either as the giver or the receiver. Your story might inspire someone to do something they might not otherwise have done…. at least that is my hope! I do appreciate the visual pun, but must ask: Is this also your way of saying seasons greetings?! Karen, you are so quick! Yes… Season’s greetings to you and yours! Another beautiful entry, Karen. I agree with the bafflement about months racing by. Ever since I returned from my month away in July I have been playing catch-up unsuccessfully and I no sooner greet a new month, then I realize it’s half over, and then it’s gone. Come on, December, slooooooooooow dooooooown. I’m happy for Jim and hope that his new housing arrangement will work out well for him. He was a good sport but so homesick. I know he appreciated your efforts to blend him into the Ashland scene, but he also wanted to assert as much autonomy as he could under the circumstances. It’s so similar to “launching” our children; there comes a time when the decisions are no longer ours to make. Jim’s being far away makes it more difficult for you, but your loving heart remains a back-up for him. Kent said the reception Saturday was lovely. Thank you for your leadership, and thank you again for the cobbler. Wish you could have seen the happy faces as they came back for seconds! Shirley, Thank you so much for your comment… You know how challenging this time has been and it is a leap of faith to let my Dad live so far away. I am hopeful that it will work out. The memorial Saturday was beautiful… and the reception was very well attended and almost fun (albeit with a sense of sadness). 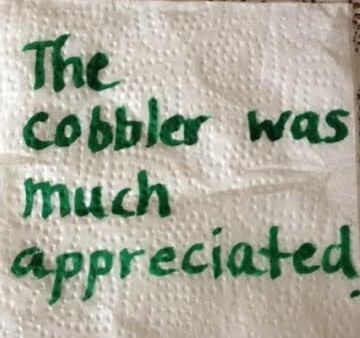 I am so very glad the cobbler made our guests happy. I think it’s lovely that we treat them as guests… with respect and dignity. And a little cobbler doesn’t hurt.